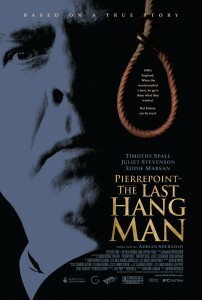 Pierrepoint is a feature film inspired by true events and is the story of Britain’s most famous hangman, Albert Pierrepoint (Timothy Spall). The film charts Pierrepoint’s meteoric rise to becoming Britain’s most famous hangman. Pierrepoint was present at the Nuremberg executions and the legendary hanging of Ruth Ellis, the last woman to be given the death penalty in England. Directed by Adrian Shergold (Persuasion, Dirty Filthy Love) and written by Bob Mills (Christmas Lights, Bob Martin) and Jeff Pope (Philomena). Starring Timothy Spall (Harry Potter Series, Sweeney Todd), Juliet Stevenson (Mona Lisa Smile, Bend it like Beckham), Eddie Marsan (Hancock, The Illusionist) and James Corden (The Wrong Mans, One Chance). The Historic Dockyard Chatham was used to film a hanging scene and towards the end of the film, where Pierrepoint has to face an angry mob as public opinion towards capital punishment begins to change. One of the most popular filming locations in Kent, The Historic Dockyard Chatham has been used for Sherlock Holmes (2009), The Bank Job (2008) and The Golden Compass (2007). Pierrepoint was released in cinemas in April 2006 and is now available to buy on DVD. This entry was posted in Filmed in Kent and tagged feature film, Pierrepoint film locations, The Historic Dockyard Chatham, Timothy Spall. Bookmark the permalink.